To get to the place where the photo above would become a reality, much had to happen. It all began a long time ago, well, it was actually 2009, when a Lithuaian conductor of the Klaipeda Chamber Orchestra was sent a link to a very famous video of a cat playing the piano. That conductor was Mindaugas Piecaitis. The cat, in case you haven’t already guessed, was me. Maestro Piecaitis is a brilliant human being, obviously, who saw the potential in the piano stylings of moi. And he set about composing a concerto inspired by those stylings. The result was a beautiful piece of music titled CATcerto. Clever, eh? The piece was premiered in 2009 by the Klaipeda Chamber Orchestra with Maestro Piecaitis at the podium and me, as guest soloist, projected onto a large screen behind the musicians. It was a rousing success and was eventually published by Peter’s Publishing. To date, CATcerto has been performed 20 times by orchestras around the world. It even made it into the Guiness Book as the first concerto ever written for a cat. Then in late 2012, Maestro and muse (that’s me) met for the very first time when Mindaugas flew to the United States and spent several days with me, my siblings, and my purrsonal assistants, Burnell and Betsy. 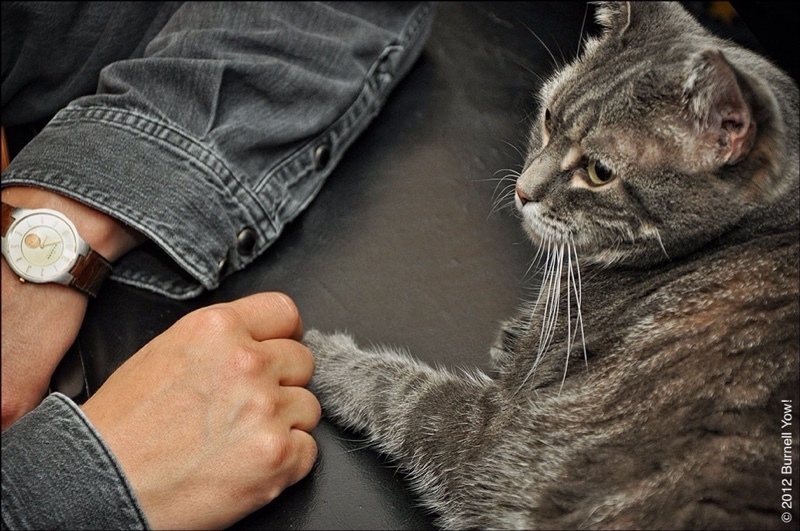 It was during the very first moments of that meeting that Burnell took the now famous photo of our paws touching on the piano bench. Maestro Piecaitis was heard to remark, “I feel I must be dreaming.” Truth be told, it was I who was humbled by his presence. A gray tabby rescued from the streets of Camden, New Jersey only to one day touch paws with the Maestro from halfway around the world. Of such things are not dreams made? You can watch the video that Mindaugas Piecaitis was inspired by HERE. And click HERE to watch CATcerto. Orchestras who may wish to perform the piece should contact Peter’s Publishing for the sheet music and the DVD for the projection. It’s an amazing story, and I have always loved CATcerto and Nora’s unique piano stylings.